Osteoporosis affects 55% of people living in the U.S. over the age of 50. The majority of these people are women, but men are at risk too. Most often osteoporosis (the disease of porous bones) affects women with a drop in estrogen production, possibly due to menopause or an oophorectomy (surgical removal of the ovaries) and men with a reduced testosterone production. Women are affected earlier because their hormone production change is much more abrupt than that of men. This disease leads to crippling pain and life-threatening fractures. However high the risks, modern science has found a way of detecting and controlling Osteoporosis. This includes a specific diet, exercise, prescription treatments with calcium and vitamin D and regular screenings with DEXA scans. It is recommended for a person at risk for osteoporosis to get regular DEXA scans every two years and once a year for a person with osteoporosis or osteopenia, a precursor condition to osteoporosis. Independent Physicians Medical Center is equipped with a Delphi bone densitometer. The Delphi is a high-performance micro x-ray scanning machine. 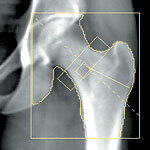 It utilizes fan beam technology and used solely for the detection of osteoporosis. DEXA scans are vital to early detection and control of Osteoporosis and can prevent a lot of pain and suffering on the part of the patient if done regularly.